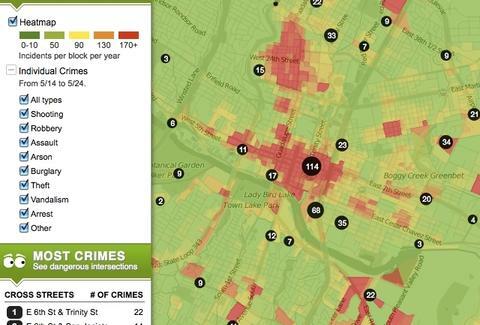 Beta-launched by a group of real estate specialists, this comprehensive visualization of local illegalities utilizes a heat map to show danger zones based on incidents per year/block, and filters results to show where you're most likely to get burgled (Rainey Street), vandalized (1st and... Congress? ), or assaulted (6th and Trinity) -- proving once-terrifying 12th and Chicon is now nothing more than an inauthentically safe place to buy crack or find a prostitute.